Bob H. in Prairie Grove, Illinois, found us on One Kings Lane. 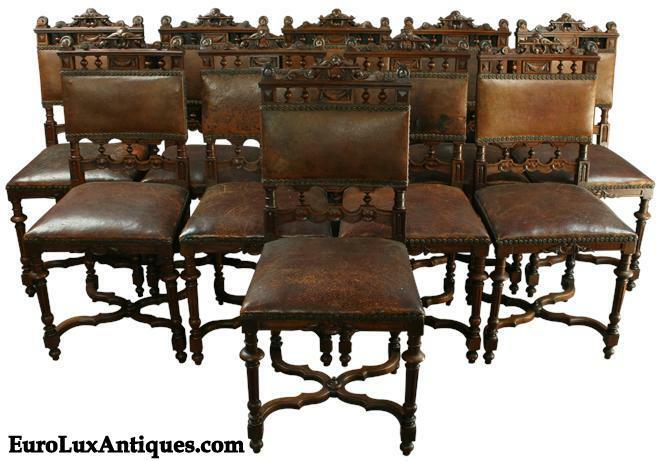 His neighbor (who is a designer) saw our set of ten antique Renaissance chairs with rich buttery leather upholstery. She thought the wonderful aged patina on the leather looked like an old football! She also thought the Renaissance chairs dating to 1900 would be perfect for Bob’s French Renaissance chateau style home, inspired by European castles. Bob wanted a table with legs that exactly matched the Renaissance chairs, so he had one custom designed by Amish craftsmen at Valley View Oak. The custom table is solid walnut to match the chairs and Bob had the stretchers under the table matched to the chair stretchers too. 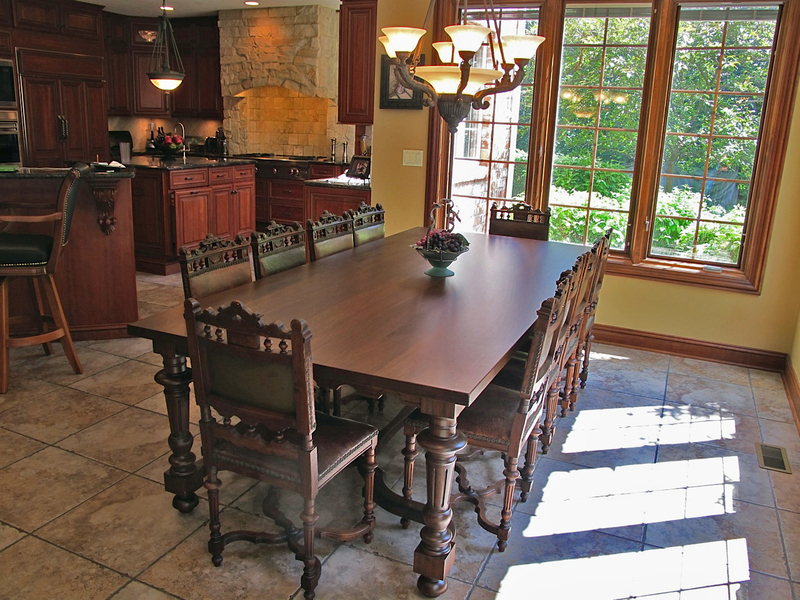 The Renaissance chairs and table ensemble does look fantastic in his open kitchen. If you turn around with your back facing the edge of the table, the kitchen opens into the great room. Bob is especially fascinated by medieval and Renaissance armor and weaponry and has quite a collection. 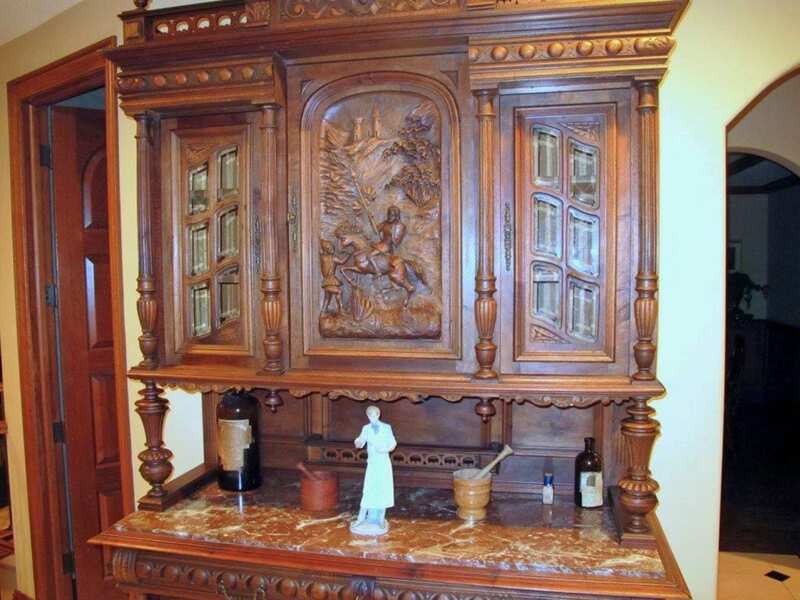 I know this interest drew him to the beautiful marble-top French Renaissance buffet on our website, carved with a knight on horseback. Bob’s designer neighbor helped him find the perfect spot in his home for the buffet. It now lives in a large, wide hallway that connects the great room to the entry foyer. A colorful medieval style tapestry hangs on the wall opposite the walnut buffet, adding another authentic touch! Bob decorated the buffet with a vintage Lladro Spanish porcelain figure of a pharmacist as that has been his profession for 30 years. He continued the apothecary theme with antique mortar and pestle sets. 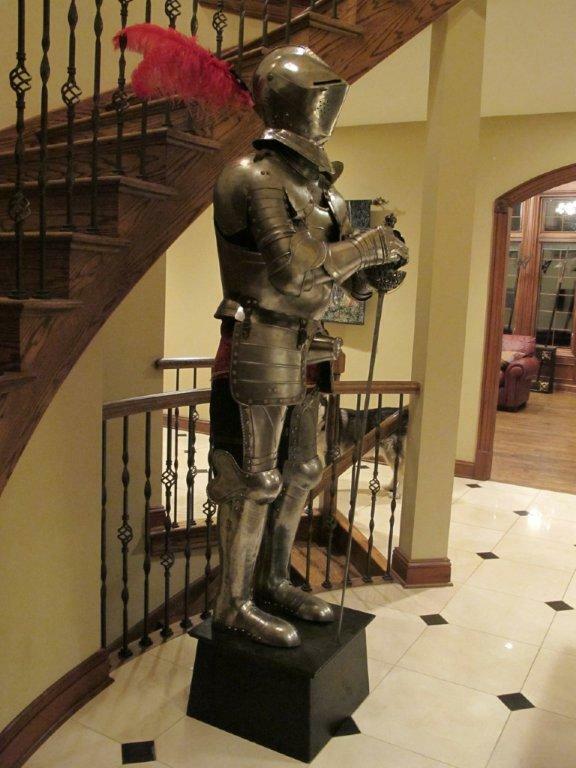 This suit of armor in his entry hallway is a perfect accent to the foyer’s marble floor and curved oak staircase. The suit of armor is an early 20th century reproduction, although the rapier sword with the suit is an original from the 17th century. One expert offered Bob a substantial sum for the rapier sword alone, but Bob decided he wanted to keep it with the armor. Bob’s home is truly original and such a thoughtful reflection of his personality and interests. 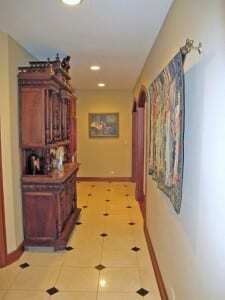 So it’s no surprise that it is featured in Crystal Lake’s 39th Annual Housewalk on September 27, 2013. 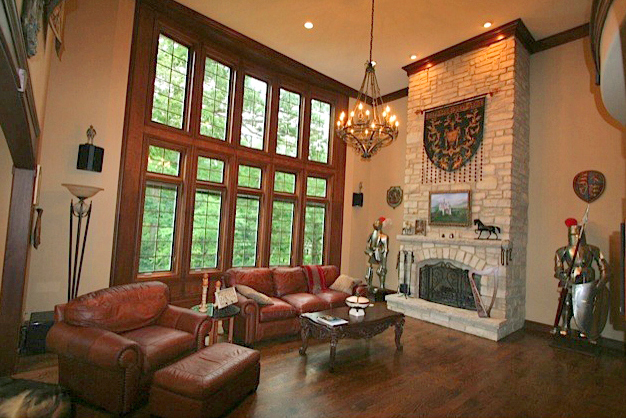 You can see the exterior of the Hurley Residence in McHenry Country Living’s Housewalk preview. A big thank you to Bob for letting us take our own mini-tour of his fabulous home! 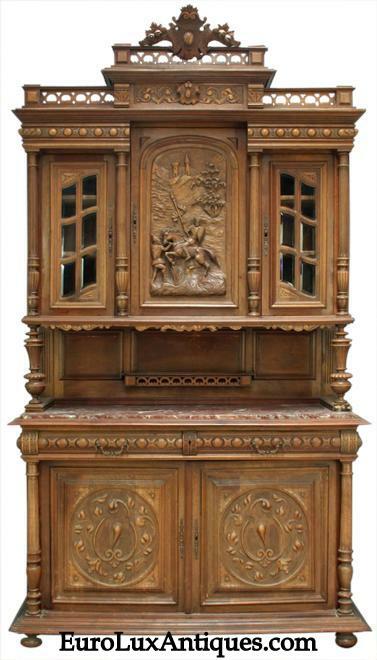 If you enjoy this decor style as much as we do, you can browse in our EuroLuxHome.com online gallery for French Renaissance chairs, buffets, and other furniture currently in our inventory. UPDATE: Bob later sent us a mural he had created, based on the knight carvings on the antique buffet. See the photo in our Renaissance Mural post! 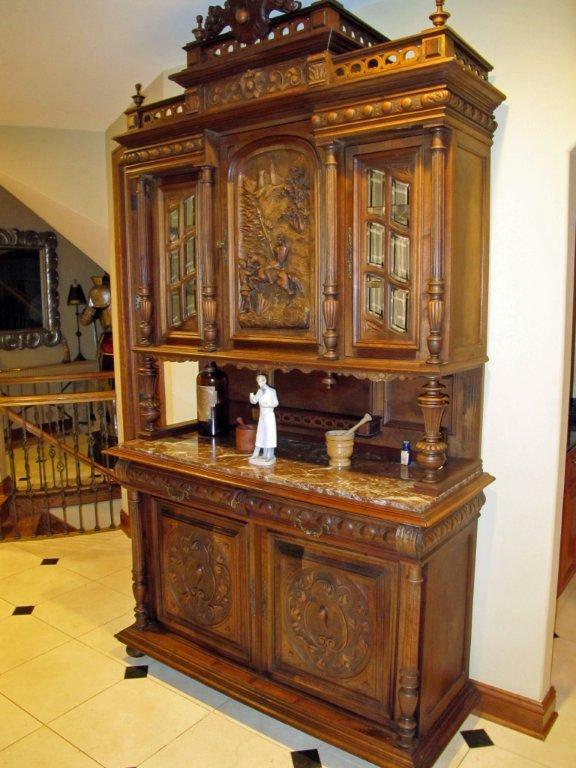 This entry was posted in Client Spotlight and tagged antique buffet, antique chairs, Antique French Renaissance Henry II Style Buffet, antique Renaissance buffet, French, French Renaissance Chairs, French Renaissance Sideboard, interior decor, medieval, suit of armor on August 25, 2013 by admin. While we don’t purchase items from individuals, we can recommend listing your antique or vintage items for sale on a variety of antique marketplaces such as Ebay, Etsy, Chairish, GoAntiques or your local CraigsList. You might also contact antique dealers in your area that might consider taking the chairs on consignment.